Who was Hiawatha and why was this Native Indian chief famous? Summary: Hiawatha was the legendary chief of the Onondaga tribe who advocated peace with the European settlers. He is credited with establishing the Iroquois Confederacy comprising of the Onondaga, Mohawk, Oneida, Cayuga and Seneca tribes who were collectively known as the Five Nations League or the Iroquois confederacy. His name was used for the hero of the epic poem by Henry Longfellow called “The Song of Hiawatha.” The following fact sheet contains interesting facts, background history and information about the life of Hiawatha and the events in history that led to his fame as a great Native American Indian leader. Co-founder of the Iroquois Confederacy, also known as the "League of Peace and Power"
The Iroquois were also known as the Haudenosaunee or the "People of the Longhouse"
Hiawatha is probably the best known name of any of the famous Native American Indians, however he remains a mixture of fact and fiction. The name of Hiawatha became famous due to the publication of an epic poem by the American poet Henry Wadsworth Longfellow (February 27, 1807 – March 24, 1882). Longfellow called his epic poem 'The Song of Hiawatha' and it was published in 1855. Henry Longfellow was the most popular poet of his day. However, Henry Longfellow's 'Song of Hiawatha' is a work of American Romantic literature and is not representative of Native American oral tradition. He was inspired by the legends and stories about great Native Indian chiefs including leaders of the Iroquois, Sauk and Fox nations. Longfellow choose the Pictured Rocks National Lakeshore on the shore of Lake Superior for the setting for his epic poem in which he conveyed the story of Hiawatha and his lover Minnehaha. Henry Longfellow made no direct reference to the Iroquois League or to any actual historical personage, but the name Hiawatha is strongly associated with the Onondaga tribe and the establishment of the great Iroquois Confederacy and the details of this great man's life are detailed below. The real Hiawatha was born c1525. He was a member of the Onondaga tribe (People on the Hills) and lived between Lake Champlain and the Saint Lawrence River. The Onondaga tribe was part of the war-like Iroquois nation. Despite the shared language and culture the different tribes of the Iroquois nation there was continuous inter-tribal warfare between the tribes. The incessant warfare between the Iroquois tribes was weakening the nation. Two men emerged who wanted to unite the tribes into one powerful force. The first man to have this vision was a prophet called Deganawida who was a great spiritual leader of the Onondaga tribe. Hiawatha who was a wise man and chief of the Onondaga tribe shared the vision of the prophet and acted as the spokesman for Deganawida. The Iroquois nation consisted of five tribes: the Onondaga, Mohawk, Oneida, Cayuga and Seneca tribes, who were collectively known as the Five Nations. The unification of the five tribes was not easy task. 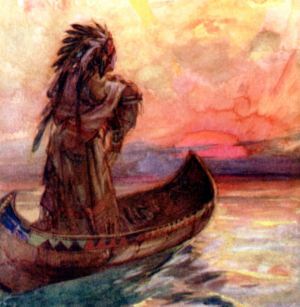 Hiawatha and the prophet Deganawida traveled across Iroquois territory talking about their ideas of strength and unification within the nation. They eventually took their message of the 'Great Law of Peace' to a council meeting of the five nations. Chief Hiawatha spoke forcefully and persuasively and the Iroquois League was established. The 'Great Law of Peace' was the basis of the Iroquois Confederacy Constitution and the prophet Dekanawida was given the title of the 'Great Peacemaker'. To ensure a good basis for the confederation of tribes the Constitution of Iroquois Confederacy was created. The constitution contained details of the function and organization of the Iroquois Confederacy. The 117 Articles of the Iroquois Confederacy covered subjects such as the Role of the Great Council and its membership, eligibility and resignation, rights and duties of War Chiefs, Women and Clans, Laws of Emigration, Rights of Foreign Nations, Rights and Powers of War, Treason or Secession of a Nation and the Rights of the People of the Five Nations. The balance and content of the constitution of the Iroquois confederacy was so strong that over the years it became to be admired by many of the American colonists and settlers. Benjamin Franklin was one of the many men who admired the democracy of Iroquois system established by Hiawatha and Dekanawida and used it as a model for the Articles of Confederation, adopted by Congress on November 15, 1777. Many of the ideas and legacy of Hiawatha therefore still live on in the United States of America.